It has come to my attention that some folks online have been making a fuss about the fact that the strategy game Rome: Total War II allows players to recruit women as generals to lead their armies in fighting around the ancient Mediterranean. They decry this addition to the game as modern politics intruding anachronistically on the purely masculine history of war. Well, that’s a load of hogwash. As your friendly neighborhood ancient historian, I’m happy to present a brief, selective, far-from-comprehensive list of women who led military forces in antiquity. Enjoy. A Sarmatian queen, 2nd century BCE, who led her people against foreign invaders. Amage, wife of Medosaccus, a Sarmatian king… seeing that her husband was diverted by luxury, took matters in hand, giving many judgments, organizing the defense of the realm, and fighting off foreign attacks. Queen of the city of Halicarnassus, 5th century BCE, who commanded a contingent of ships in the Persian king Xerxes’ invasion of Greece and advised Xerxes on the conduct of the war. She led the forces of Halicarnassus, Cos, Nisyurs, and Calyndus, crewing five ships. Of all the ships in the fleet, besides the Sidonians, hers were considered to be the best, and of all the allies she gave the king the best advice. Artemisia stationed armed soldiers in hiding near Latmus. She then held a celebration at the sacred grove of the Mother of the Gods, which is about seven stades [around a kilometer and a half] from the city with eunuchs, women, flute-players, and drummers. When the people of Latmus came out to marvel at this spectacle, the concealed soldiers emerged and seized the city. A British queen, 1st century CE, who led a rebellion against the Roman Empire. 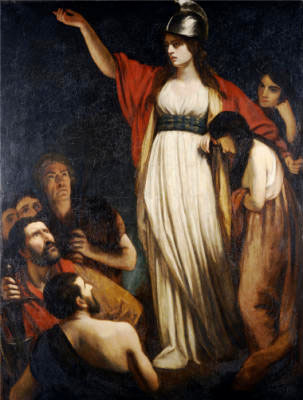 [Before battle,] Boudica rode before each of the tribes in a chariot with her daughters, reminding them that it was a custom among the Britons that a woman should lead them in war. A British queen, 1st century CE, who allied with the Romans against Venutius, her ex-husband. [Cartimandua and Venutius] soon began to quarrel, which turned swiftly to open war…. At first they fought among themselves, and Cartimandua, by cunning stratagems, captured Venutius’ brother and closest relatives. Half-sister of Alexander the Great and an accomplished general in her own right. Cynna, daughter of Philip [II], was trained in warfare and commanded armies in the field. Facing the Illyrians in battle, she slew their queen with a blow to the throat and cut down many of the Illyrians as they fled. Queen of Epirus, 3rd century BCE. Deidamia, daughter of Pyrrhus, captured Ambracia to avenge Ptolemy, who had been killed by treachery. Queen of the city of Dardanus in Anatolia, 5th century BCE. She went into battle in a chariot. She gave orders, formed the line of battle, and granted awards to the soldiers she saw to be worthy of them. No one ever defeated her. Queen of the Tanukhid alliance of Arabs, 4th century CE, who fought against the Roman Empire, then made peace and later became a Roman ally. Mavia, Queen of the Saracens, began to pummel the cities on the frontiers of Arabia and Palestine with her attacks and ravage the neighboring provinces as well. With frequent engagements she wore down the Roman army, killing many and putting the rest to flight. Queen of the city of Barke in North Africa, 6th century BCE. When her family was driven out of power, she allied with the Persian governor of Egypt and asked for military forces to retake Barke. Then Aryandes [the governor of Egypt], feeling compassion for Pheretime, gave her all the forces that were in Egypt, both land and naval. Parthian noblewoman, 2nd century BCE. Rhodogune was bathing and beginning to wash her hair. A messenger came to report that a subject nation was in revolt. Without washing out her hair but just tying it up as it was, she mounted her horse, led out the army, and swore an oath that she would not wash her hair until she had put down the rebellion, and indeed, after long fighting, she triumphed. After her victory, she bathed and washed out her hair. A Greek woman from Argos, 6th century BCE, famous for her poetry and for leading the defense of Argos against a Spartan siege. Above the theatre there is a shrine of Aphrodite, in front of which stands a carving in stone of Telesilla, the lyric poet. Her books are scattered in front of her feet and she holds a helmet, looking at it and about to put it on…. It happened that the Argives had fared very badly in battle against Cleomenes, son of Anaxandridas, and the Spartans. Some fell in the battle, while others fled to the sacred grove of Argus and were slaughtered… so Cleomenes led the Spartans against an Argos bereft of men. But Telesilla gathered the slaves and those who had been left behind as too young or too old to bear arms and stationed them on the walls while she herself went around to the houses and temples collecting what weapons were left and arming the women who were in the prime of life. She stationed these women where she knew the enemy would attack. When the Spartans made their attack, the women stood their ground and were not terrified by their battle cry. Princess of the Ixomatae, a people of the Eurasian steppes, 4th century BCE. She was married to Hecataeus, the king of the Sindi. When Hecataeus made a new marriage to ally himself with Satyrus, king of the Bosporus, he imprisoned Tirgatao and contemplated killing her, but she escaped and led her people in war against Hecataeus and Satyrus. Hecataeus’ and Satyrus’ people searched desperately for her, fearing that she would stir up the Ixomatae to make war, but they could not find her at all. She crossed rough and desolate country, hiding in the woods during the day and traveling at night, until at last she reached the Ixomatae, where her kin ruled. Her father had died, but she married his successor and roused the Ixomatae to go to war. With many allies from the nearby tribes, she first ravaged the Sindi of Hecataeus, then crushed the kingdom of Satyrus. Queen of the Massagetae, a Central Asian people, 6th century BCE. She led her people against the invasion of the Persians under Cyrus. When Cyrus would not listen to Tomyris [who had offered to make peace], she gathered all her forces and stood against him. I consider this battle to have been the fiercest ever fought among non-Greeks, and indeed I have learned that it was. It is said that at first they pelted one another with arrows from a distance, then, when their missiles were exhausted, they fell on one another and fought hand-to-hand with spears. For a long time, they were engaged in the fight, and neither side would give way. At last the Massagetae gained the upper hand. Much of the Persian army was wiped out and even Cyrus himself was slain. Some of these accounts come from sources which are far removed from the original events in space and time. The details they preserve may not be reliable, as stories got better in the telling, but the same is true of ancient accounts of men in command of armies. Given Greek and Roman prejudices against women taking an active role in public affairs of any kind, it is likely that many more stories about military women have been lost entirely. This is only a small sample of the stories we can tell about women who led armies in the ancient world. Don’t let anyone tell you that female generals are unhistorical. In fact, taking women out of a game like Rome: Total War would be more a reflection of modern political pressures than leaving them in is.